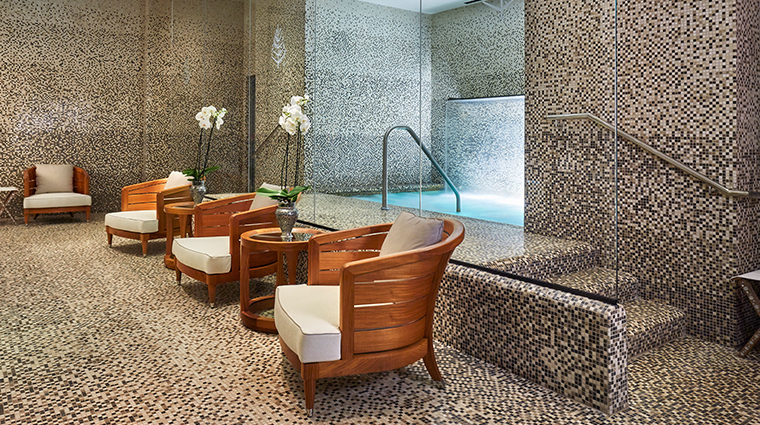 A feeling of calm envelops you as soon as you step into The Spa at Four Seasons Hotel Bahrain Bay. 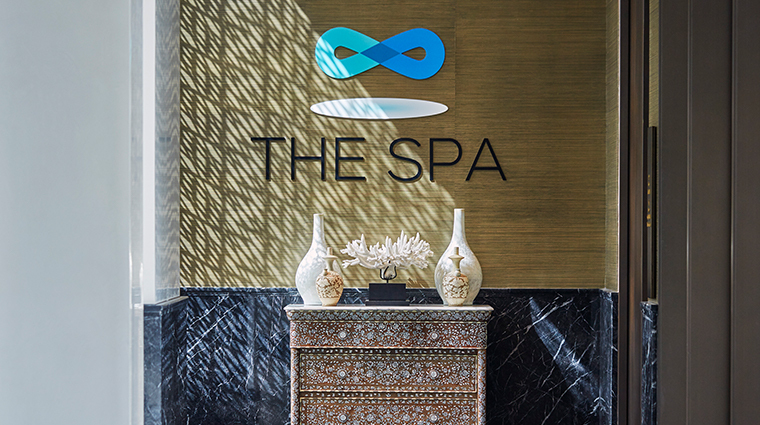 Four buildings linked by lush gardens and pathways, the luxury spa has beautifully patterned Islamic décor and ample natural light that give it a sense of place while setting it apart from the dusty urban streets of Manama. 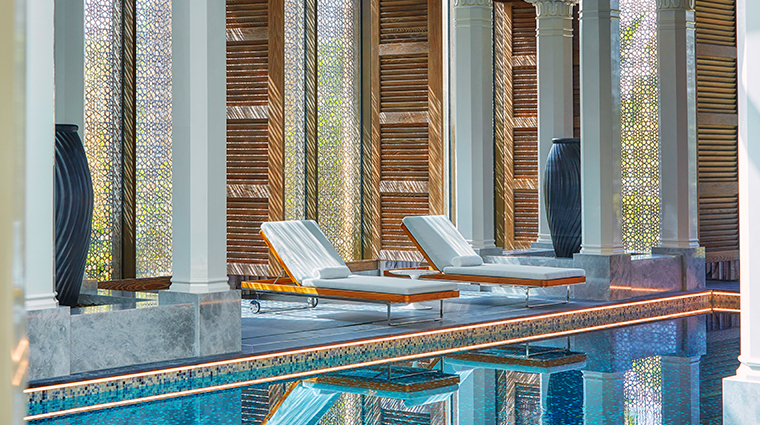 Seek refuge in the 37,512-square foot facility for a wide array of healing treatments based on Asian, Middle Eastern and Indian traditions or a choice of five pools. A 24-hour unisex and ladies-only gyms allow you to de-stress through exercise, like a fun antigravity aerial yoga class. Don’t miss a chance to unwind in the hammam, where you’ll be cleansed, exfoliated and hydrated until your skin is left feeling silky and lustrous. Those entering from the front side of the hotel pass an intricate and soothing fountain and other décor designed by Pierre-Yves Rochon, while those coming from the outdoor pool area will walk through an oasis of trees and flowers; everyone is immediately welcomed at front desks separated by gender and offered a tour of the sprawling facilities, which include 17 treatment rooms. The design of the geometrically patterned window coverings allows bright light to flood into the gym, relaxation room and other areas while blocking the view from the outside. Service at The Spa at Four Seasons Hotel Bahrain Bay is attentive but never intrusive, with staff making sure every need is met without you having to lift a finger. Dusty Middle Eastern air causing respiratory distress? 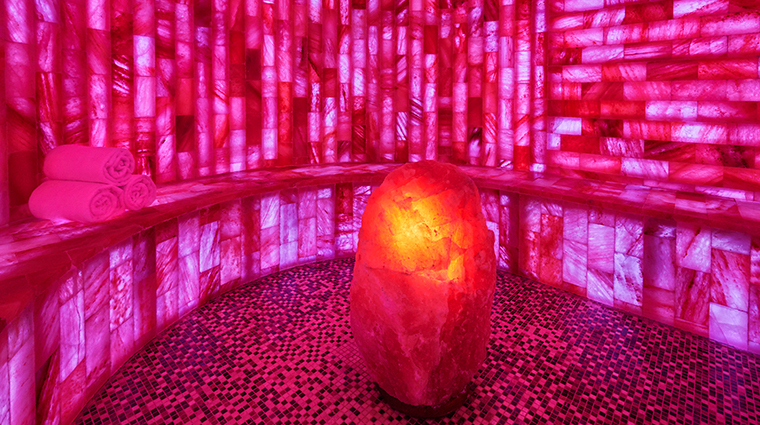 Spend some time relaxing in the salt inhalation room, which helps reduce inflammation and detoxify the lungs. This palatial spa is the second largest in the Four Seasons portfolio (The Spa at Four Seasons Hotel Westlake Village is the first), and the property sells memberships for those who wish to enjoy the extensive facilities more regularly. 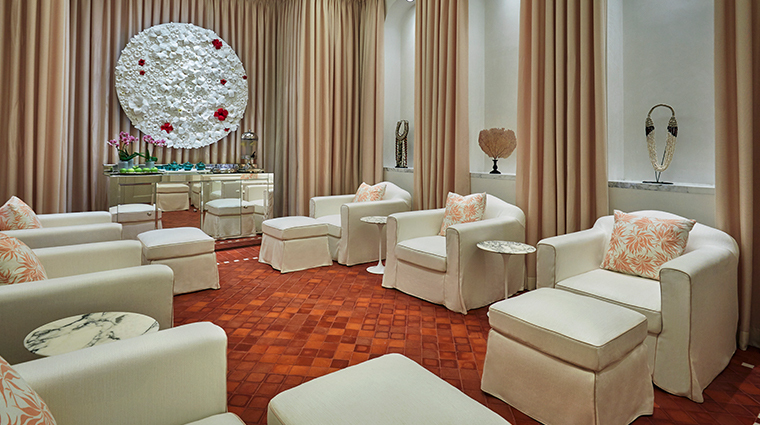 Whether you prefer a morning massage or a late-night body wrap, the spa can accommodate — treatments are available from 9 a.m. to 11 p.m. The spa’s whirlpool, steam room, salt room and locker rooms are accessible as early as 6 a.m., while the gym is available for use 24 hours a day for hotel guests. The tiny Pavia boutique, just outside the main spa entrance, stocks designer swimwear, active wear, sunglasses and other resort necessities. 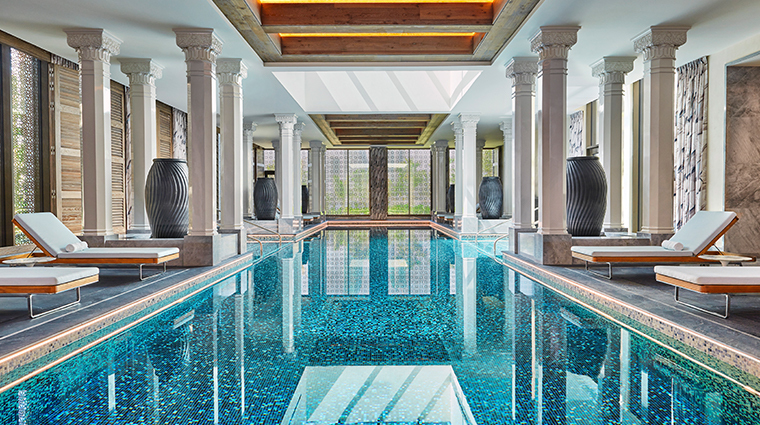 The gorgeous 1,598-square-foot indoor spa pool is perfect for swimming laps or lounging on a hot day, but it can get crowded during ladies-only hours. Though pre-natal massage is available, none of the spa’s treatments are recommended for women in their first trimester of pregnancy. 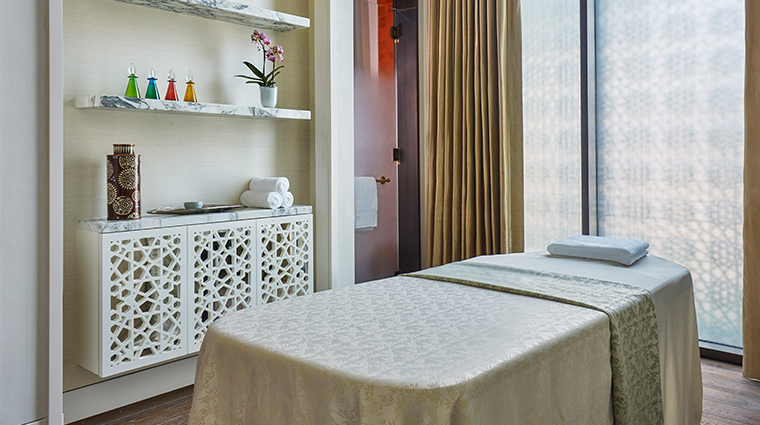 The Spa at Four Seasons Hotel Bahrain Bay provides an extensive selection of massages. One signature, inspired by Ayurveda, is designed to balance energy in the body and relieve muscle and joint pain; another invigorating offering incorporates oud oil to ease stress; and the chakra-balancing rubdown is designed to promote relaxation and mental clarity. A quintessential spa experience in this region is the hammam, which involves a steam bath and a vigorous all-over scrub. At the Bahrain spa, you have your choice of hammam rituals, all of which promise to fully cleanse the body and remove dead cells for a radiant glow. Those looking for a youthful glow can choose from a plethora of facials, including a crystal healing therapy designed to release tension and eliminate fine lines, and clinical facials to resurface and exfoliate the skin. Treatments incorporating products infused with diamonds and 24-karat gold can be added on to massages, facials and body wraps for a luxurious touch. 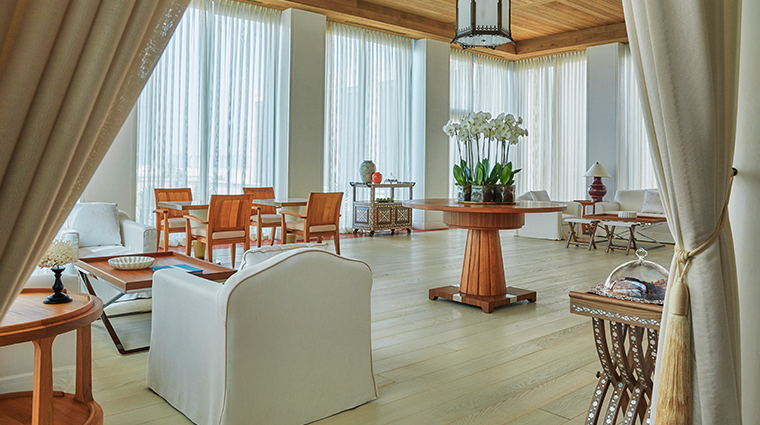 For an Eastern flavor, the spa boasts a collection of relaxing experiences ranging from chakra-balancing massages, to ratnakara (ocean-inspired) services that promote balance and calm, and an oud oil ritual with anti-aging benefits. Three different 45-minute family bonding packages are available so even the youngest spa goers can enjoy some prime pampering. 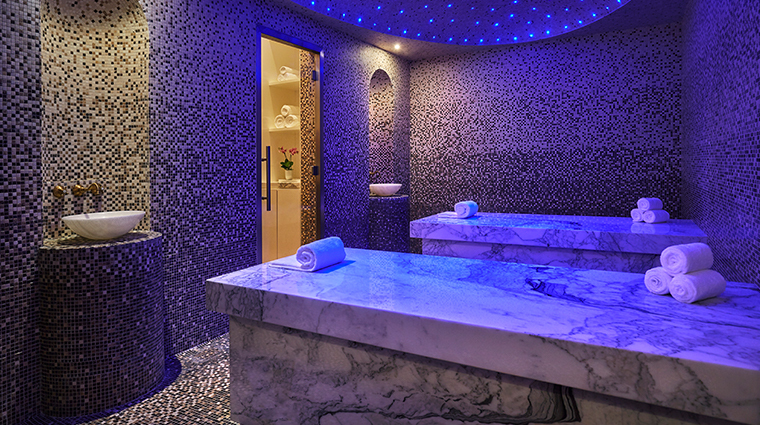 Every aspect of The Spa at Four Seasons Hotel Bahrain Bay is luxurious and calming, from the lobby and relaxation room to the fitness centers and locker facilities. Delicious and soothing ginger tea is served in the relaxation rooms, and the gyms have complimentary fruit and fresh juices. Arrive an hour early to see everything the spa has to offer and to spend time at the indoor pool, in the salt room or the whirlpool — an attached waterfall sets this hot tub apart from similar facilities — before a treatment. A TIGI concept salon on the premises provides a variety of hair and beauty services for women, while a barbershop caters to gents.